...added to the wishlist - that sounds brilliant! You're right, Victor: there really is little if any relation between Small Batch, which I still love, and Legacy. I tried Legacy yesterday for the first time and was, simply put, awed. It is utterly magnificent, a true treat, and the best Canadian whisky I have ever had. It's actually, for me, right up there on the world's pedestal of great whiskies. Agreed, @Requiem, this is great stuff! If you're exploring the high end of Canadian whisky, you might also want to take a look at what Forty Creek has to offer, especially the Confederation Oak Reserve and the soon-to-be-released John's Private Cask Nº1. @dbk: Okay, I'm looking forward to sifting through your reviews and to see what you think of the latest Private Cask--maybe then I'll dive in. I guess it's high time I retried FC. 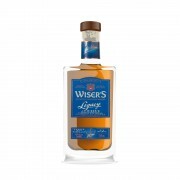 Random note: the LCBO website states this would make "a delightful companion to roast duck". Someone try it! Thanks Victor for a wonderful and comprehensive review. I look forward to tasting The Wiser's and if the Planets are in alignment when my oldest girl exits Vancouver, I'll do just that - I see that there is a 'Red Letter' edn. could it possibly be better? @A'bunadhman - I doubt that there could be a better Canadian than Legacy, except perhaps another expression of Legacy. The Red Letter is magnificent yet it is a very different whisky than Legacy; however, it is one of the few that I would accept as a worthy alternative....nuff said, you asked Victor. @A'bunadhman, soon you should have your answer as to what your daughter has brought back for you from British Columbia. I missed this post of yours originally because I was at that time driving...to Canada. I agree completely with @paddockjudge in his comments above. Wiser's Legacy and Wiser's Red Letter are quite different, and both are excellent. Red Letter is also extremely difficult to find now, and costs three times ($ 150) as much as does Legacy.